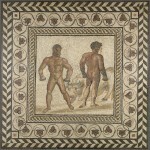 The Getty Museum in Los Angeles has an exceptional collection of Roman floor mosaics from the Imperial era. 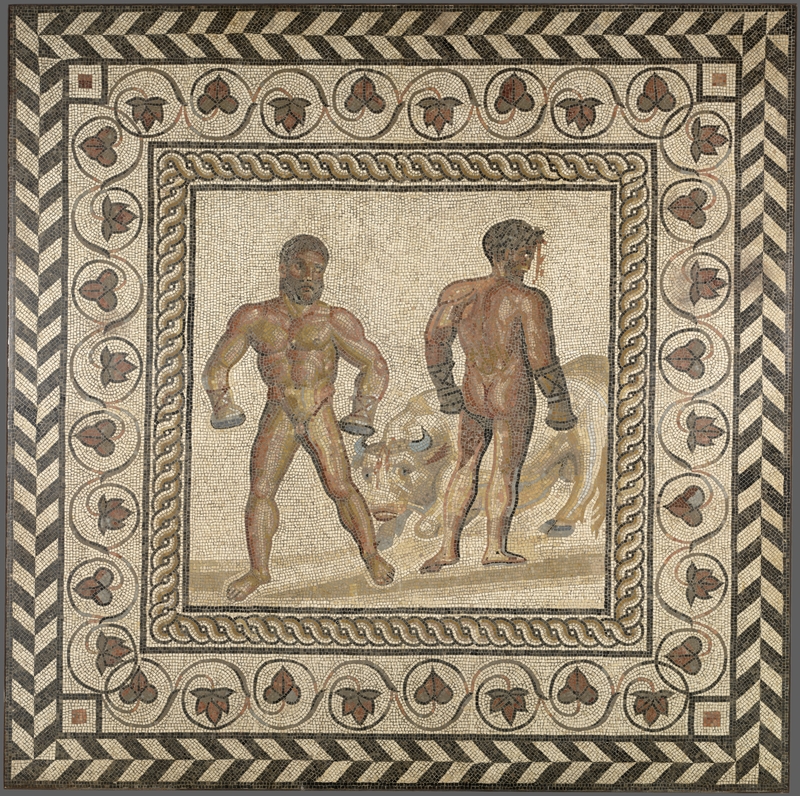 Some of them have been on display consistently, but others will be seen by the public for the first time in Roman Mosaics Across the Empire, a new exhibition that opened on Wednesday at the Getty Villa. 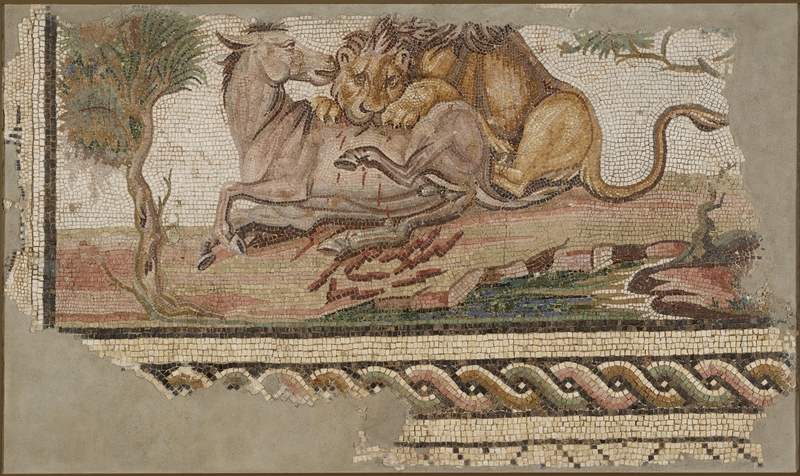 It features mosaics from provinces of the Roman Empire all over the Mediterranean — Italy, France, North Africa, Syria — done in different styles with different themes. There’s bear hunt from Baiae, outside of Naples, a head of Medusa surrounded by a glorious optical illusion-inducing geometrical design from Rome, an Orpheus surrounded by animals from Saint-Romain-en-Gal, France, a hare and two birds with geometric border panels from Antioch, Syria, a dramatic lion attacking an onager from Hadrumentum, modern-day Sousse, Tunisia. These are top quality artworks which adorned the homes of the very wealthy, public baths, even early Christian churches. The show also features a close look at the Getty Conservation Institute’s work conserving the mosaics from the Imperial Roman heyday of Bulla Regia in Tunisia, North Africa. 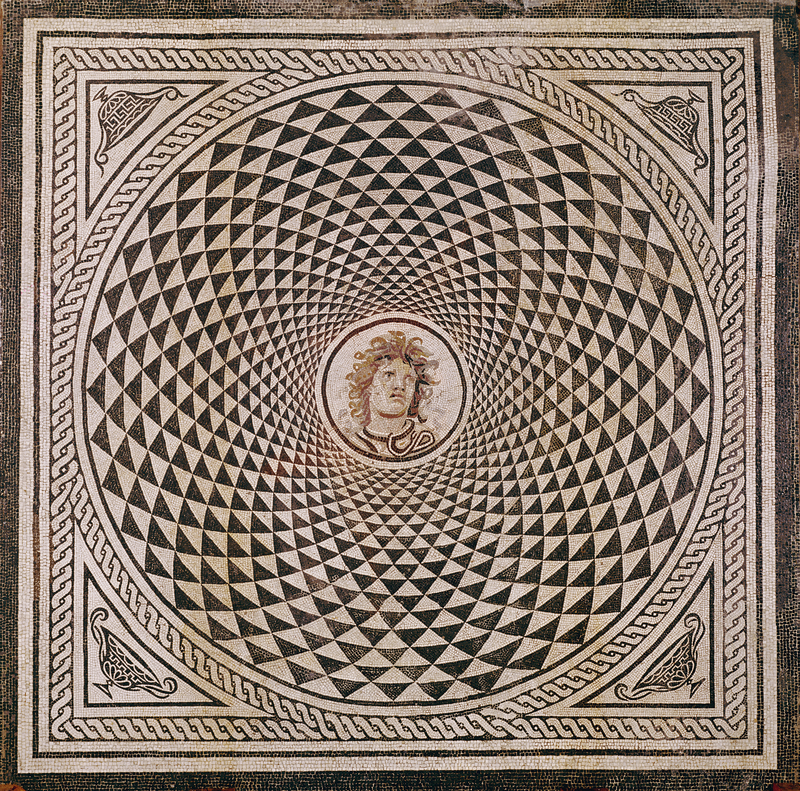 Known for its unique villas with subterranean floors — smart design in the heat of Tunisia — Bulla Regia had the greatest numbers of senators in Roman North Africa. It was an important city and its exquisite art and architecture testify to that importance. The GCI is working with the Institut National du Patrimoine of Tunisia and the World Monuments Fund to fully conserve one of the most important private residences in the city, the House of the Hunt, and to devise a plan for the long-term conservation and maintenance of the 400 mosaics that have already been unearthed at Bulla Regia over the past hundred years. Some of the works will be restored for display; others will be reburied. 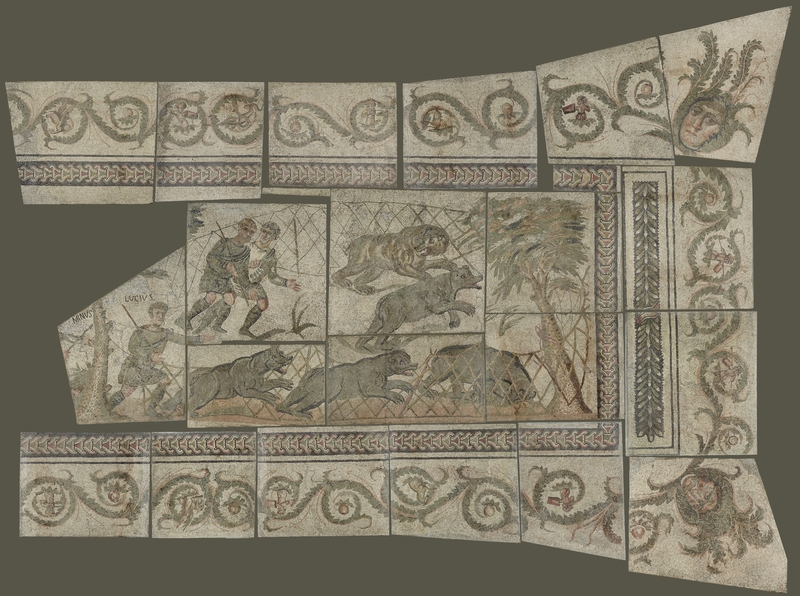 The idea is to make Bulla Regia a template for in situ conservation that can be applied to mosaics elsewhere in North Africa, the Middle East and elsewhere in the Mediterranean. 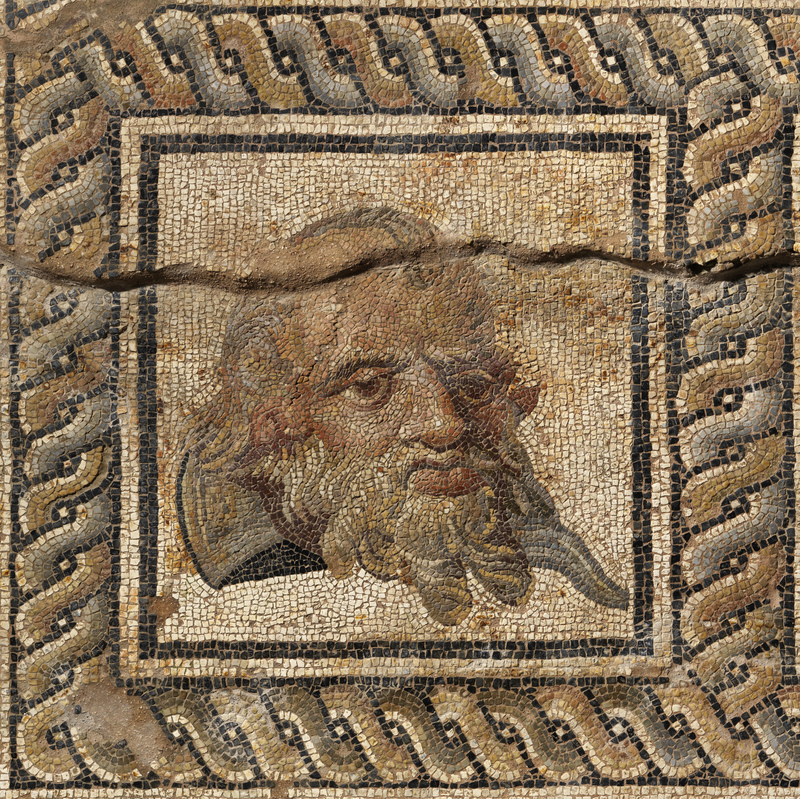 The focus on best practices of situ conservation is in marked contrast to the Getty’s past see-no-evil acquisition policy evinced in more than one of the mosaics on display in this exhibition. The Getty bought 23 panels of the Bear Hunt in 1972 from a Switzerland-based antiques dealer (surprise!) who told them only that it had been in an Italian collection. It was almost certainly illegally exported, but the museum looked the other way as it so often did. Recently Getty researchers attempted to trace the ownership history and there’s a big gap between 1929 and 1972. The last known owner in 1929 was refused an export license because there were doubts as to whether he actually had legal title to the mosaic. Somewhere in those four decades, probably closer to 1972 than 1929, the mosaic was trafficked to Zurich and thence to the Getty. 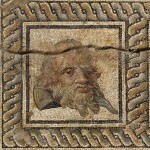 Four other panels from the original mosaic were eventually found by the Italian police and are now in the Museo Archeologico Nazionale in Naples. The Getty is offering a number of lectures related to the exhibition. The Handling Session looks particularly compelling. 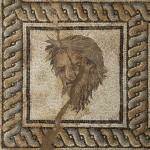 How were mosaics created from pieces of stone and glass? Learn how these intricate architectural decorations were made in this multisensory handling session. Touch tools and materials similar to those used by ancient mosaicists, including tesserae, slaked lime, marble dust, and nippers. Lucky Angelenos can take an early lunch and handle tesserae every Thursday and Friday from 11:00 AM-12:00 PM through September 9th. The exhibition runs until September 12th, 2016. 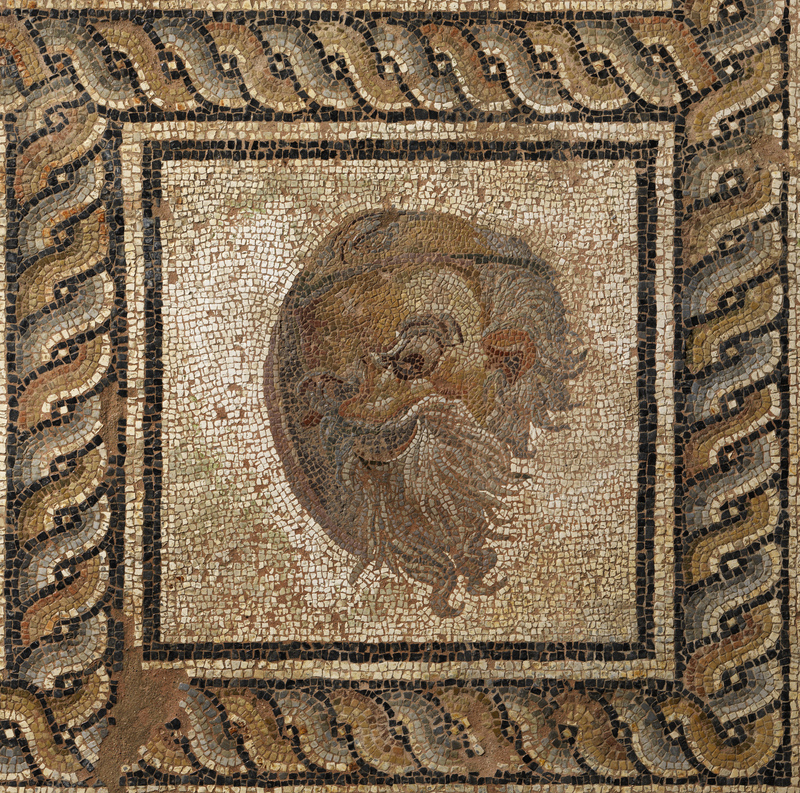 For those of us who won’t be able to see the mosaics live, the Getty has made a companion catalogue to the exhibition available free online: Roman Mosaics in the J. Paul Getty Museum. 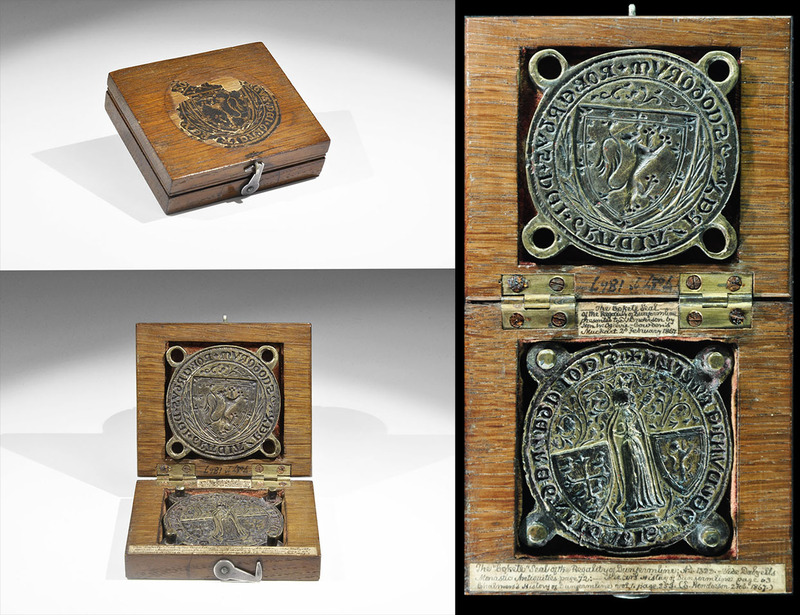 A unique double seal matrix commissioned by Robert the Bruce that is one of very few surviving objects linked directly to King Robert I has been sold to an overseas buyer and is in danger of leaving the UK. The seal sold at auction on December 4th, 2015, for £151,250 ($217,450), well above the pre-sale estimate of £80,000-120,000 ($115,140-172,710). The buyer is American and applied to the Culture Ministry for an export license. The Art Council’s Reviewing Committee on the Export of Works of Art and Objects of Cultural Interest (RCEWA) recommended that Culture Minister Ed Vaizey block export to give UK museums or collectors the opportunity to raise the purchase price and keep the artifact in the country. In 1315, Robert the Bruce granted the Abbey, with which he had a longstanding relationship and where he would be buried after his death, a royal charter. The two parts were pressed together over a large blob of wax to form a seal. The wax seal would then be attached to an official document with a piece of parchment (for a brilliant example of attached seals acting as signatures, see the letter to Pope Clement VII from the peers of England asking for Henry VIII’s marriage to Catherine of Aragon to be annulled). 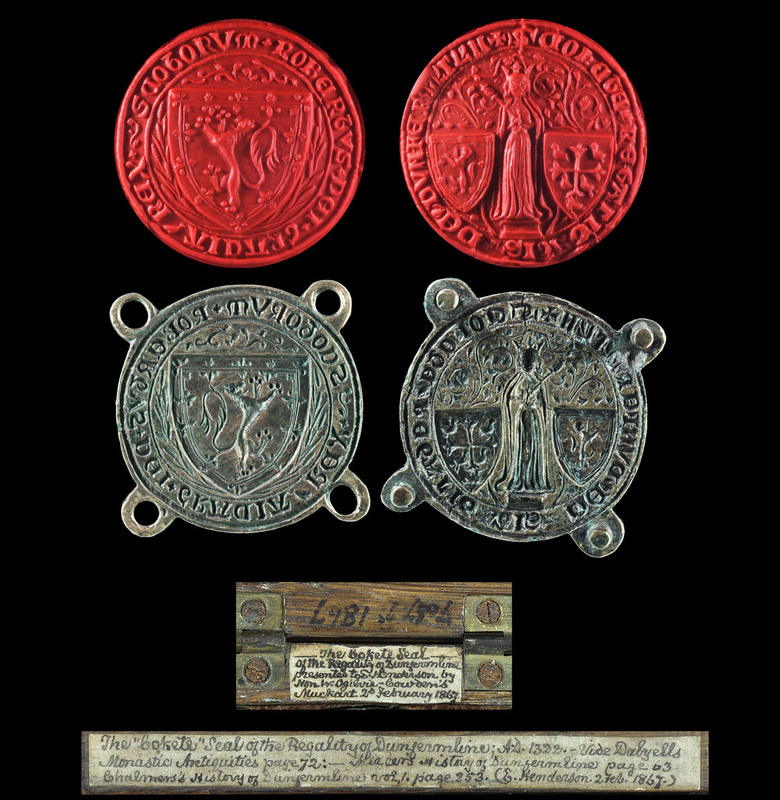 The obverse seal matrix features an image of Saint Margaret, Queen consort of King Malcolm III of Scotland, founder and patron of Dunfermline Abbey, and is bordered with the Lombardic Latin legend “+ S’COKETE REGALITATIS.DE. DVNFERMELYNN,” (Cokete Seal of the regality of Dunfermline). The reverse features the royal arms of Scotland bordered with the legend “+ROBERTVS DEI GRACIA REX SCOTORVM” (Robert, by the Grace of God, King of the Scots). The RCEWA made their recommendation on the grounds that it was of great value for the study of medieval goldsmith work and sigillography and the re-establishment of Scottish institutions under Robert the Bruce. The Scottish government has declared itself in support of all efforts that would keep the seal matrix in the UK, ideally in a Scottish museum, but there’s no official campaign that I could find. Here’s an Indiegogo campaign that’s been set up by a concerned individual who would use the funds to acquire the seal and donate it to the National Museum for Scotland. It’s less than 1% funded at this point, and I suspect the money is more likely to be raised by the institution itself tapping its private donors and launching a public campaign like the Victoria & Albert Museum did with Wolsey’s Angels. The National Museum already has an impression of the obverse in its collection. I imagine they’d be keen to have the original matrix pair. Time’s awaistin’. The temporary bar expires on June 21st. If there’s a good faith effort to raise the money and it looks like they have a chance of reaching the goal, the deadline may be extended until September 21st. 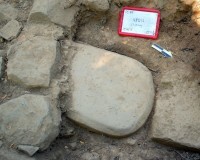 Archaeologists and students with the Mugello Valley Archaeological Project excavating the ancient Etruscan settlement of Poggio Colla about twenty miles northeast of Florence have discovered an ancient stele with a long inscription in Etruscan. 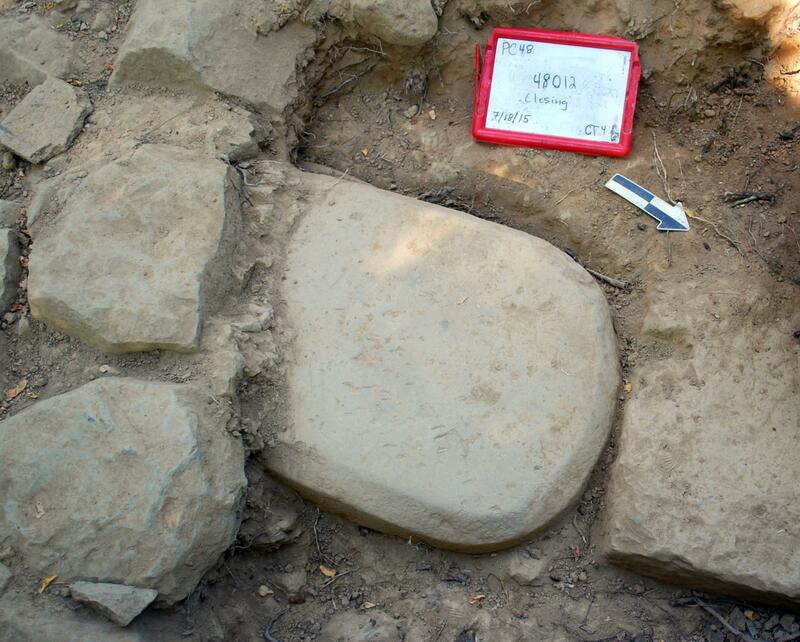 Just days before the end of the dig, the team found an oddly shaped sandstone slab embedded in the foundations of a temple wall. When they first unearthed a section of the stone, they weren’t sure what it was. 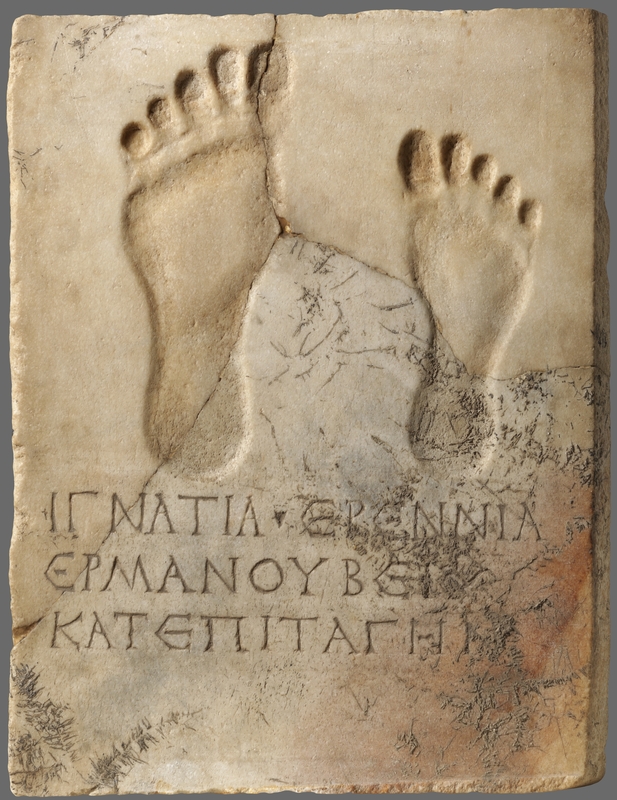 An unfinished column base or a recycled podium stand were suggested as possibilities, but when more of the slab was revealed, they saw the faint traces of an inscription and realized it was stele. 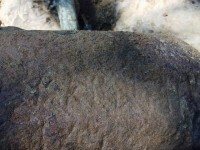 It took the team several days of cautious excavation to find the inscription was an unusually long one, with multiple characters engraved along the edges of the stele. The slab weighs about 500 pounds and is almost four feet high and more than two feet wide. It dates to around the 6th century B.C. Archaeologists believe the stele was part of a sacred display in the first temple built on the site, an oval structure made of wood that bucchero pottery fragments date to after the early 7th century B.C. It was demolished around 2,500 years ago and new, larger temple was built with a stone podium and stone Tuscan Doric column bases. The old stele was reused as a foundation stone in the new temple. The news of the find quickly spread through the archaeological community of Tuscany. Two days after the stone was excavated, visiting Etruscan scholars watched as professional art and artifact movers recommended by the Tuscan Archaeological Superintendency lifted the stele from the site, strapped it to a sled and slowly lowered it down the wooded hillside to a waiting pickup truck. It was then transported to the laboratories of the Superintendency in Florence for conservation. Conservators are photographing and laser scanning the stele to reveal the full details of the inscription. The sandstone has been worn and chipped away and one side has been reddened, probably by fire. 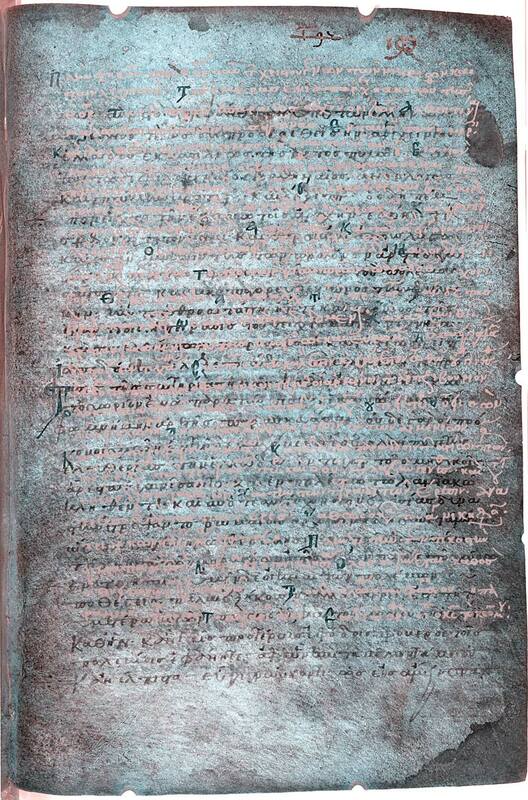 It will have to be cleaned before experts have a chance of deciphering the inscription, but they have counted more than 75 characters (letters and punctuation marks), an unusually long text for an Etruscan stele. 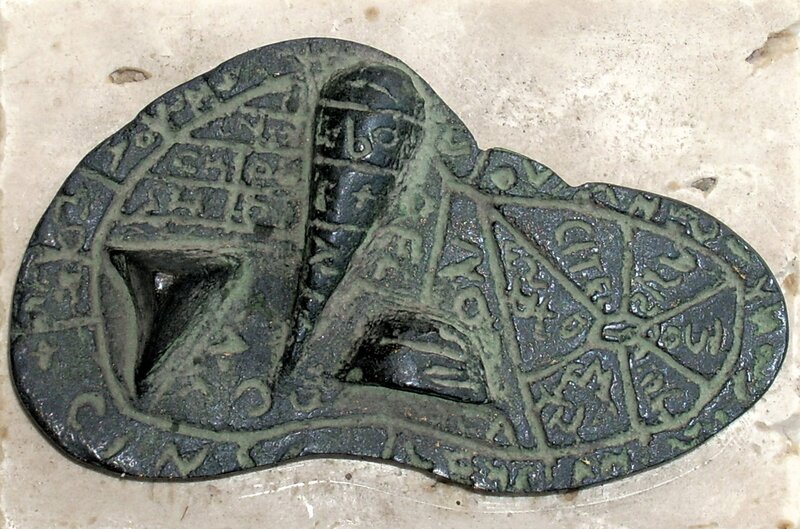 Etruscan is often described as a “lost” language, and while it’s true that there are no known living languages related to it, it’s not an untranslatable mystery. In fact, scholars know a fair amount about it from the approximately 13,000 inscriptions in the language that have been discovered. The known vocabulary is limited because most of those inscriptions are very short funerary texts found in tombs or “property of” lines on bronze mirrors. The stele is not a funerary text. It’s a religious dedication from an early phase of the site. Its location adds to its rarity since most Etruscan inscriptions have been in what was once southern Etruria. Poggio Colla is in the northern Etruscan territory. 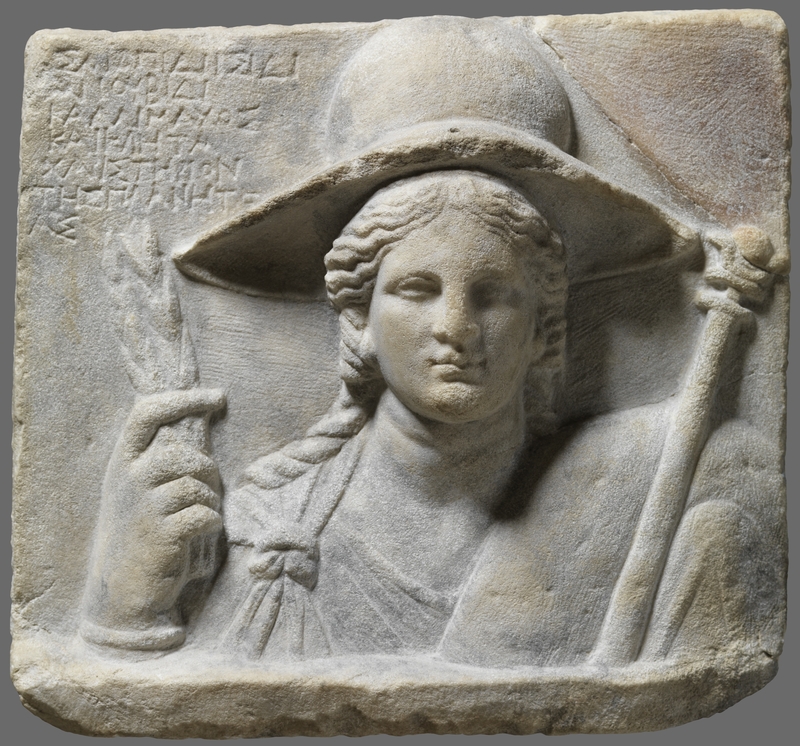 It would be a rare discovery to identify the Etruscan god or goddess to which the sanctuary was dedicated. 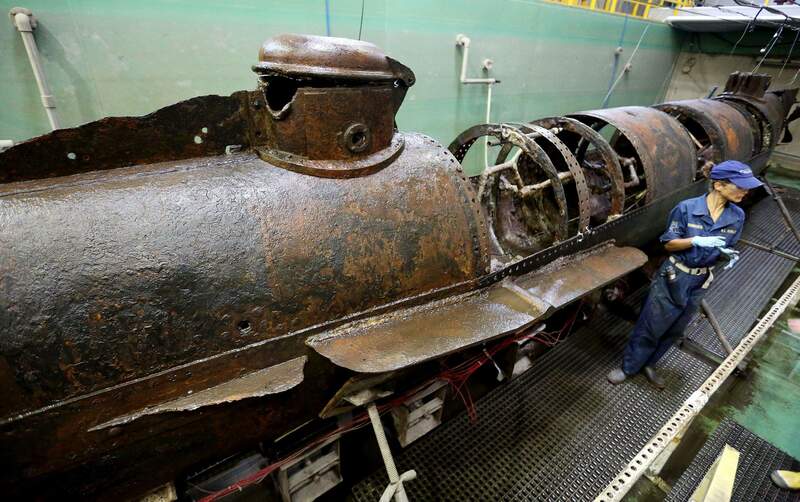 The iron body of the Confederate submarine H. L. Hunley has been revealed after 137 years in the salt water of Charleston Harbor, 13 years in a tank of cold fresh water and two years off and on in a sodium hydroxide solution. Conservators at Clemson University’s Warren Lasch Conservation Center have been working to preserve the delicate vessel since it was raised in 2000. The long water bath was necessary to slowly stabilize the iron which would have cracked and corroded if exposed to oxygen after so many years underwater. The weak sodium hydroxide solution (99% water, 1% NaOH) helped leech salt out of the iron and soften the concretion layer. A combination of rust, sand, rock and assorted ocean debris, concretions are hard as concrete. The concretion layer that coated the entire submarine, inside and out, was so thick, the original iron has been obscured since the Hunley was first raised from the harbor floor. Some areas of concretion were harder than the iron underneath them. In order for the sodium hydroxide treatment to leech the corrosive salt out of the iron skin effectively, the concretion had to be removed first. In May of 2014, the submarine was immersed in sodium hydroxide for the first time. That initial three-month soak was intended to loosen the concretions. When the tank was drained of the solution after three months, conservators had three days to chip away at the concretion before the tank was filled again. In a cramped workspace that was a hazardous caustic environment requiring the use of face masks, goggles and specialized protective suits, conservators used small drills, chisels and hammers to remove the rock-like incrustation. It was painstaking, dangerous work. One false move with a hand tool and the iron skin of the submarine could be irreparably damaged. After three days of assiduous labor, the tank was refilled with the sodium hydroxide solution for another three months, then drained for chipping and on and on like that for more than a year. At the end of the process, conservators removed 1,200 pounds of concretion, about the weight of a grand piano, just from the exterior of the submarine. The Hunley‘s iron skin was seen by human eyes for the first time since the Civil War. 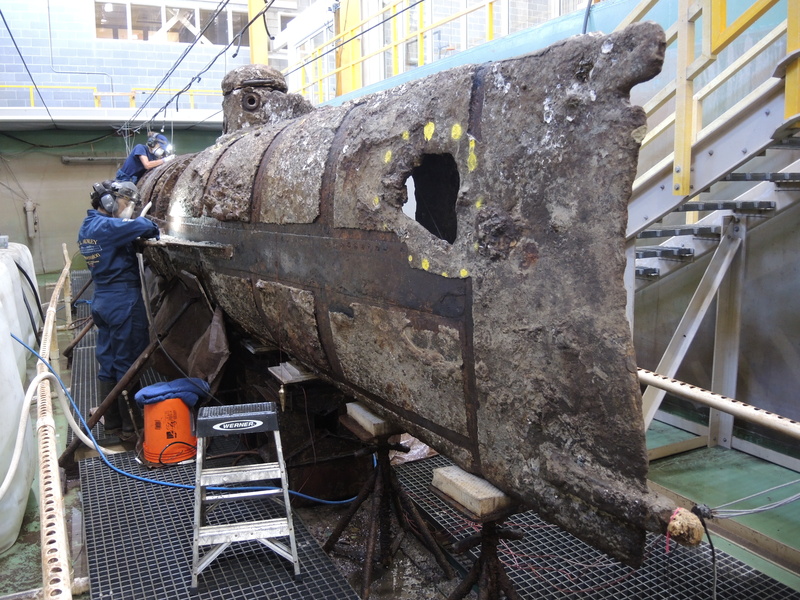 Conservators had hoped that removing the concretion would reveal damage that might explain what happened to the H. L. Hunley on the night of February 17th, 1864. We know that its mission to sink the USS Housatonic was successful. The submarine drove a spar-mounted torpedo into the starboard stern of the Union warship and its payload of 135 pounds of gunpowder exploded, blowing a large hole in the side of the enemy vessel. While the hand-cranked submarine with its crew of eight men was very close to the explosion — the spar was only 16 feet long — the Hunley and its crew survived. They signalled the success of the mission with a blue magnesium light, as previously arranged, and then were never heard from or seen again. They did find some clues on the skin of the submarine. Archaeologists found damage to the bolts and clamps of the boom that held the spar in place. They also discovered a crack in the bow where the spar was mounted. 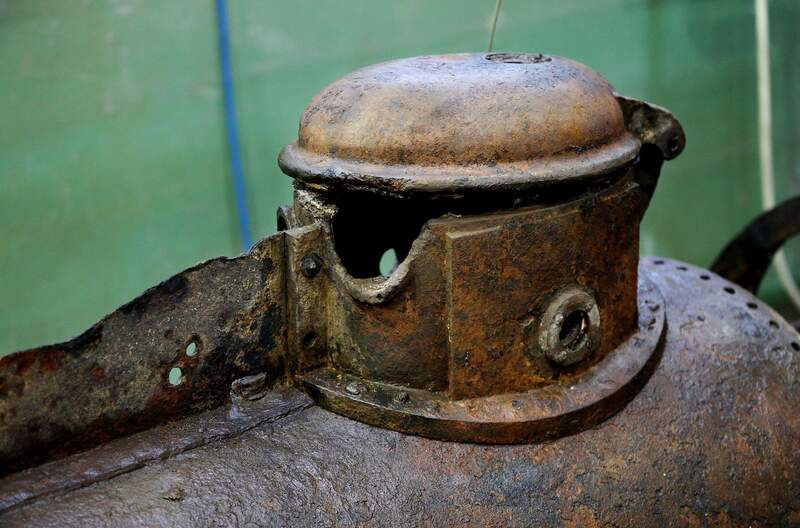 The impact from the explosion or the ramming appears to have torn out a clamp and cracked the Hunley‘s bow cap. That’s not a smoking gun, however. Archaeologists were looking for evidence of bullet damage. Records indicate the submarine was seen before the attack and the Union ship fired on it. Bullet holes would have confirmed this report and would have explained why the vessel was too damaged to return to safety. One large hole was found, but it was the result of years of scouring by sand and salt before the submarine was covered by the sand on the ocean floor and kept relatively intact. Conservators have now moved their attentions to the interior of the submarine. It too is covered in concretions, and this workspace is even more cramped. The crew compartment is less than four feet in diameter. 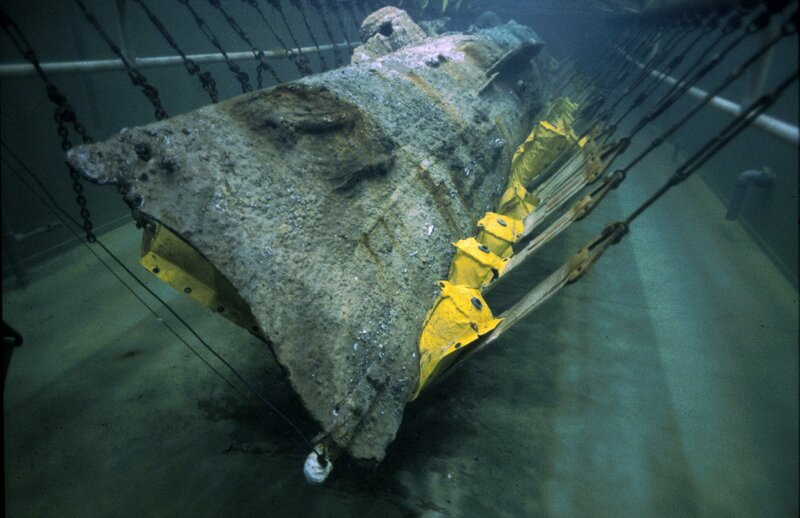 It’s unlikely they’ll find one key piece of evidence that explains the fate of the Hunley in the interior. This part of the project is focused on what happened in the claustrophobic nightmare of that tiny iron cigar in the last moments of the crewmen’s lives. Conservators hope to find artifacts — personal effects, uniform buttons, tools — that will help them piece together what happened to the Hunley. Anytime an artifact is found, the scientists will have to stop scraping to map its location on a 3-D grid. Scafuri said that all these clues are probably all scientists will have to piece together the final moments of the first attack sub. 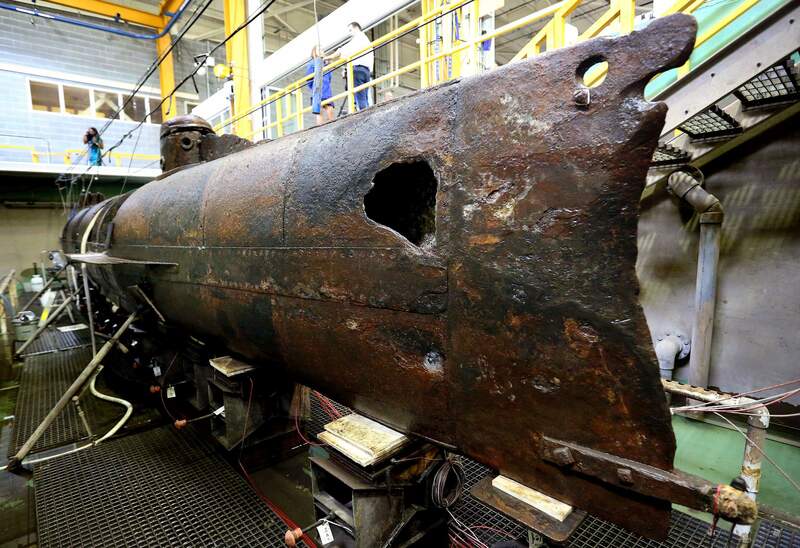 Every piece of evidence suggests one thing and eventually that research will point to an answer for the biggest lingering question: why didn’t the Hunley return after sinking the Housatonic. Between work on the interior, conservators are busy restoring pieces of the sub that were removed — rubber gaskets and glass deadlights, for instance. All those pieces will be replaced when the caustics treatment ends and the sub is ready for dry display. 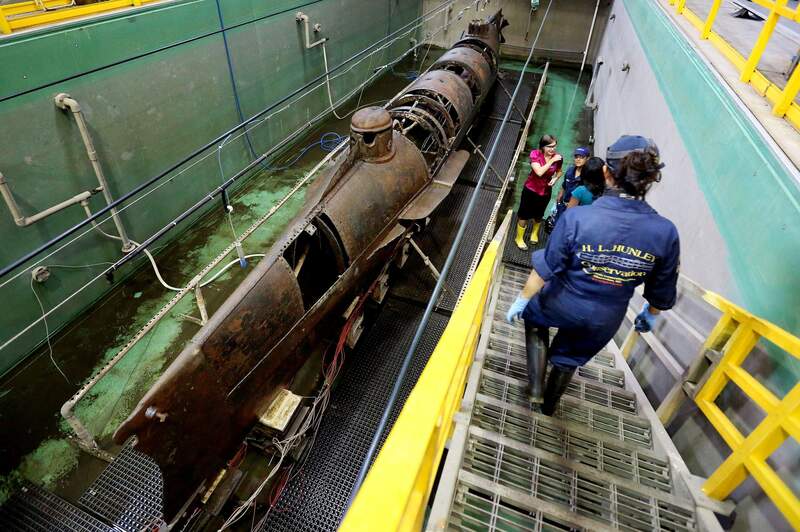 It’s going to be a few years before the submarine is ready for permanent display in the open air. The sodium hydroxide soaks will continue for at least five years and possibly as many as seven more years. The solution must be replaced every three to four months even when all the concretion has been removed because it will get too salty to be effective. There are some excellent shots in this video by the Friends of the Hunley of the Hunley before and after the concretions were removed. It looks amazing. Nestled in the northern foothills of Mount Olympus, the ancient town of Dion was perfectly situated for sacrifices to the gods. It was a lot easier to carry animals to the base of the mountain than to climb its nearly 10,000-foot heights. The first known altar to Zeus Olympios was built in Dion in the 10th century B.C. The small town grew into a prominent city under the Macedonians who revered it as the center of their religion. 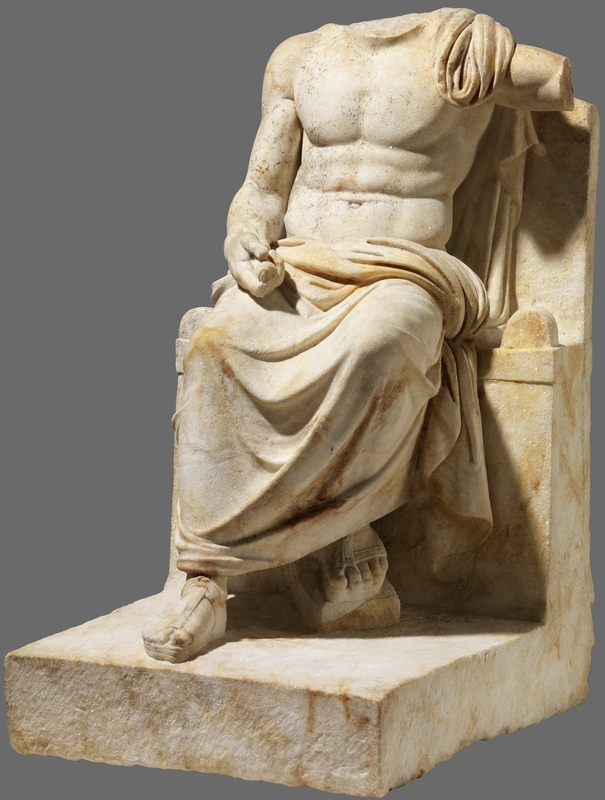 In the late 5th century B.C., Macedonian King Archelaus I founded the Olympian Games there, a yearly festival of the arts and athletic contents in honor of Olympian Zeus and his daughters the Muses. Top athletes and artists flocked to the festival from all over Greece. The kings of Macedon made sacrifices at the altar to ring in every new year (the end of September in the Macedonian calendar), celebrated their military victories and invoked the protection and support of Olympian Zeus before setting out on new adventures. Philip II of Macedon celebrated his successful siege and destruction of Olynthos in 348 B.C. at Dion. His son Alexander the Great sacrificed to the gods there before taking his conquering armies East. He also imported the worship of Isis from Egypt to Dion. 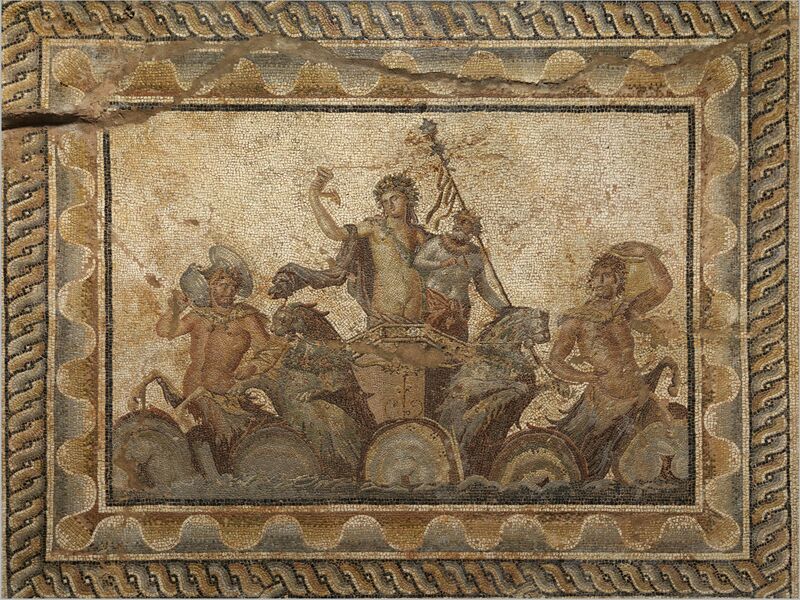 The strong association with Alexander the Great served Dion well under the Roman emperors. Octavian founded a colony there in 31 B.C., and later emperors in the 2nd and 3rd centuries lent it their support. In the waning days of the empire, Dion was still prominent as the seat of a bishopric. Bishops of Dion took part in important church synods (Serdike in 343 A.D. and Ephesos in 431 A.D.), but at the end of the 5th century the city fell to the armies of Ostrogoth King Theodoric the Great and it never recovered. It gradually lost importance and population due to a series of earthquakes and floods from the river Vaphyras. By the 10th century it was an abandoned ruin. The ruins of Dion were identified as the ancient sacred city of the Macedonians in 1806, but organized excavations didn’t begin until 1928. There was a 30-year lapse in archaeological exploration between 1931 and 1960. 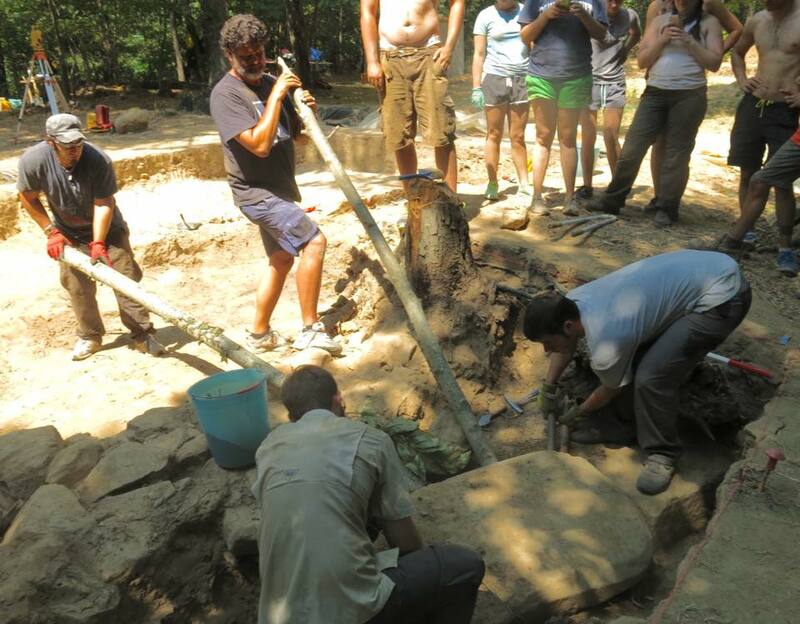 Since 1973, Dr. Dimitrios Pandermalis has led excavations at the site, returning every summer with a team of archaeologists, students and volunteers from the modern village to brave the oppressive heat and humidity. They have expanded the excavation area considerably to include the ancient sanctuaries, graveyards, tumulus burials and the town center. Spared development, reconstruction and the potentially destructive fumbling of early archaeologists, Dion has proved an archaeological treasure trove. Thanks to its wetlands environment at the base of the mountain between two rivers, Dion’s remains have been well preserved by water and mud layers. All that mud and water is no picnic for the archaeological team to have to dig through, but it’s been worth it. Excavators have unearthed the remains of sanctuaries dedicated to Olympian Zeus, Zeus Hypsistos, Demeter, Isis and Asclepius. There’s a Hellenistic theater, a Great Baths complex, a partially preserved 2nd century A.D. Roman theater, a Greek and Roman wall, a 5th century Christian basilica and several Roman-era villas, most notably the Villa of Dionysus discovered in 1987. The Villa of Dionysus was built in the second half of the 2nd century as a complex with an elegant home, a shrine to Dionysus, a bathhouse, a library and storefronts. 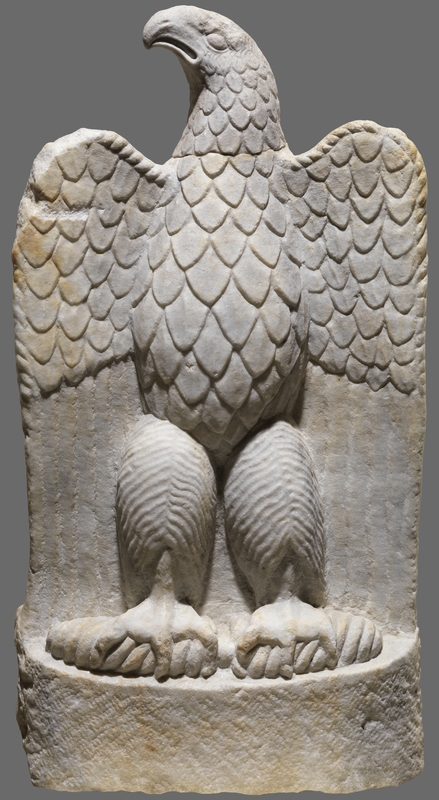 Archaeologists discovered a great many ancient artworks: sculptures, decorative elements from expensive furniture, and mosaics of exceptional quality. 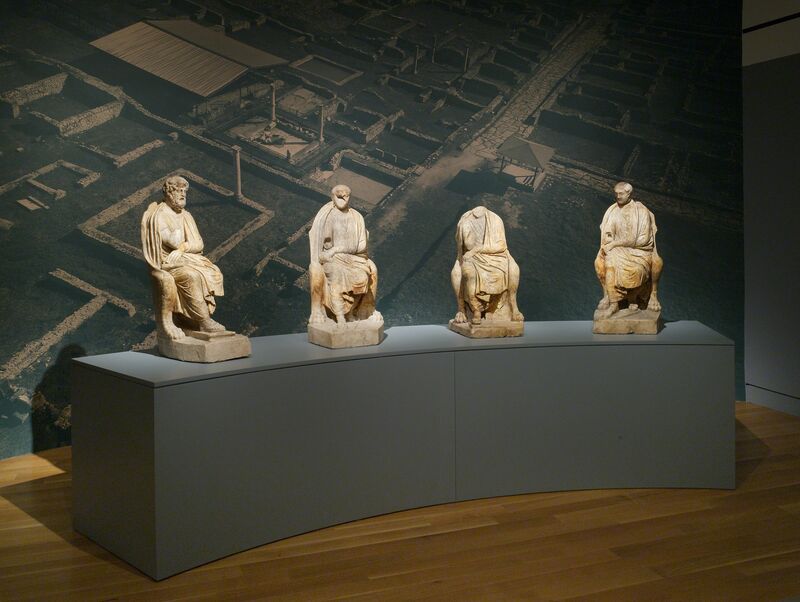 Among the most prized sculptures is a group of four seated men representing Epicurean philosophers, three students and one teacher identifiable by his bearded adulthood and the open scroll he holds. 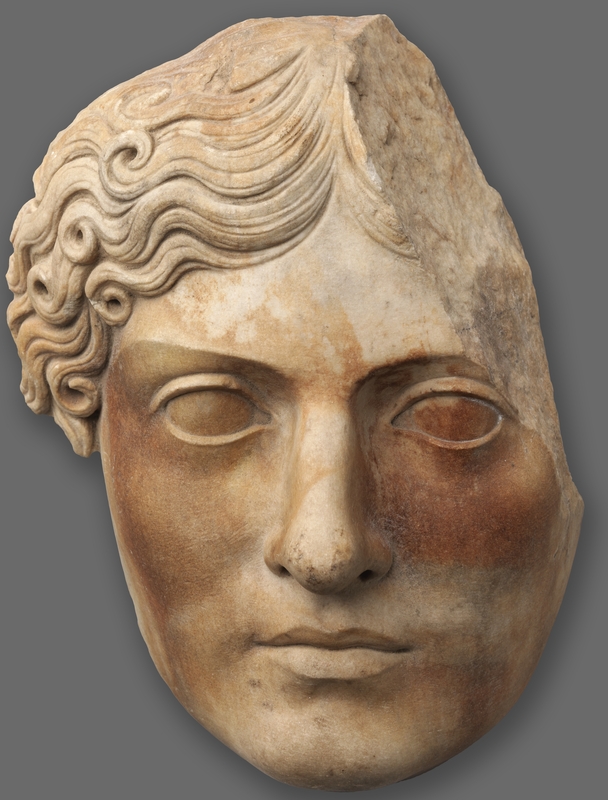 The heads of the students were recarved in the 3rd century AD to give them portrait features, possibly to make them look like members of the family who lived in the house at the time. 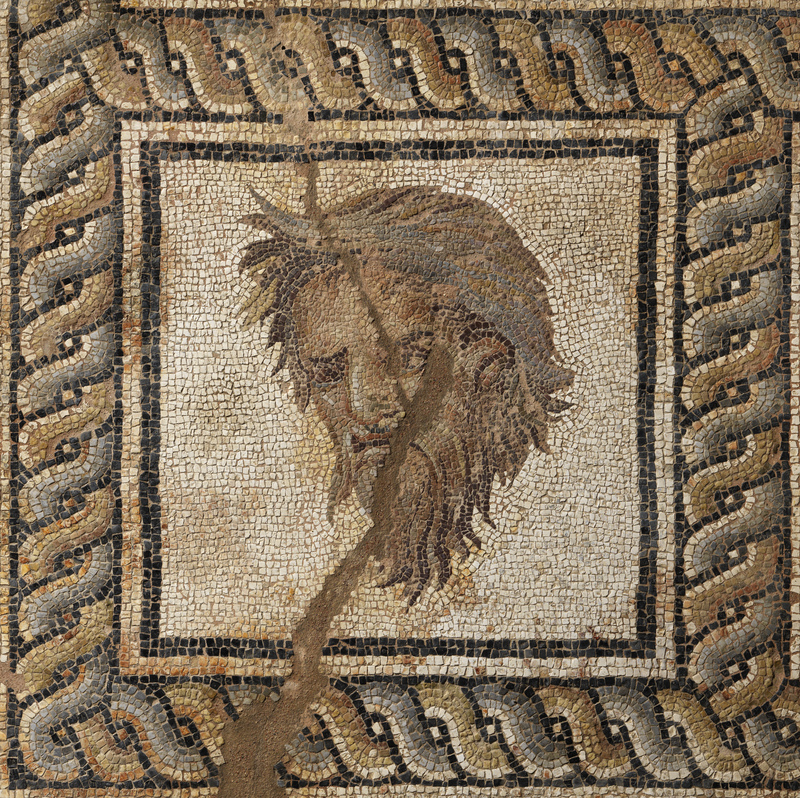 Other artworks found in the house include a hauntingly beautiful portrait of Agrippina the Elder, mother of Nero, and a glorious 100 square meter floor mosaic in the banquet hall depicting the Epiphany of Dionysus. Now Dion is paying the Onassis Foundation back in the most wonderful way: by loaning the Onassis Cultural Center in New York City more than 90 artifacts — mosaics, sculptures, jewelry, medical implements, terracotta vessels, glassware — dating from the 10th century B.C. to the 4th century A.D. Many of these pieces are in the US for the first time, and they are absolutely stunning. 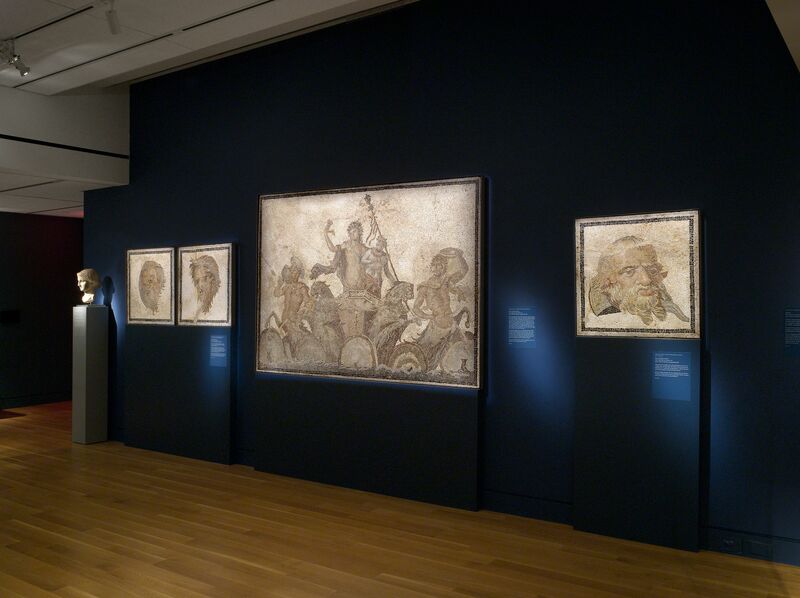 There’s the central panel of the Dionysus mosaic and several of the masques around it, the sculptures of the four philosophers, that beautiful portrait of Agrippina, an Iron Age spiral brooch with textile fragments still attached to it, statues and stele of the gods. 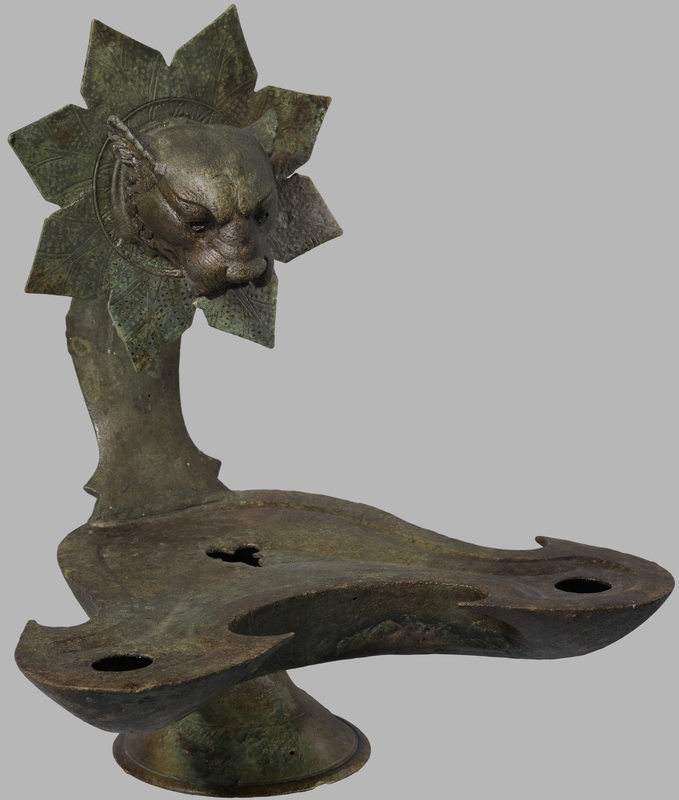 There are utilitarian artifacts as well, including a copper oil lamp decorated with the head of a panther and a 1st century B.C. copper speculum, which looks remarkably similar to the modern version. 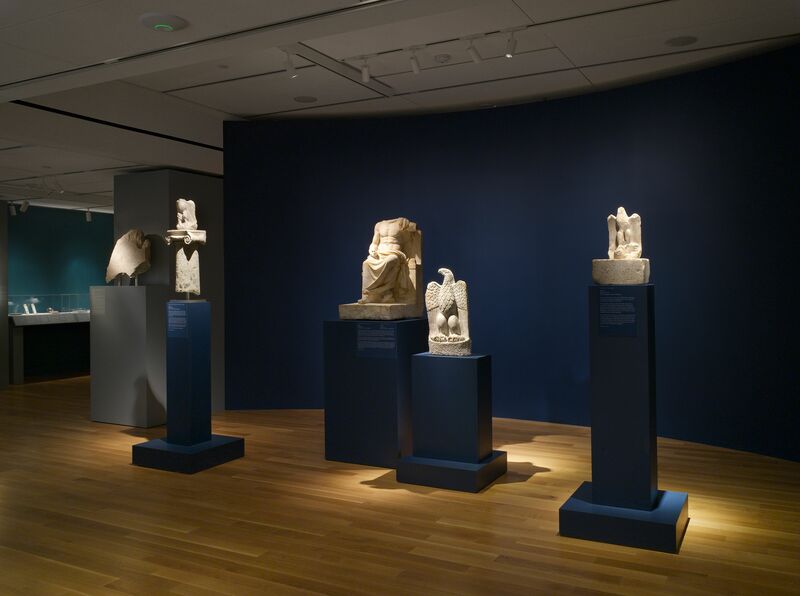 The Gods and Mortals at Olympus exhibition opened March 24th and runs through June 18th. They’ve really gone all out to put together a spectacular and content-rich show with cross-generational appeal. You can amble through the artifacts of Dion conversing with philosopher Simon Critchley, or lure your museum-resistant friends to the Museum Hacks series “for people who don’t like museums.” There’s even a videogame where children (and grown-ups!) can become the archaeologist excavating Dion. Entrance to the exhibition is free. There are 49 replicas and 19 original historic cannons at the Fort William Henry Museum in the Adirondack town of Lake George, New York. 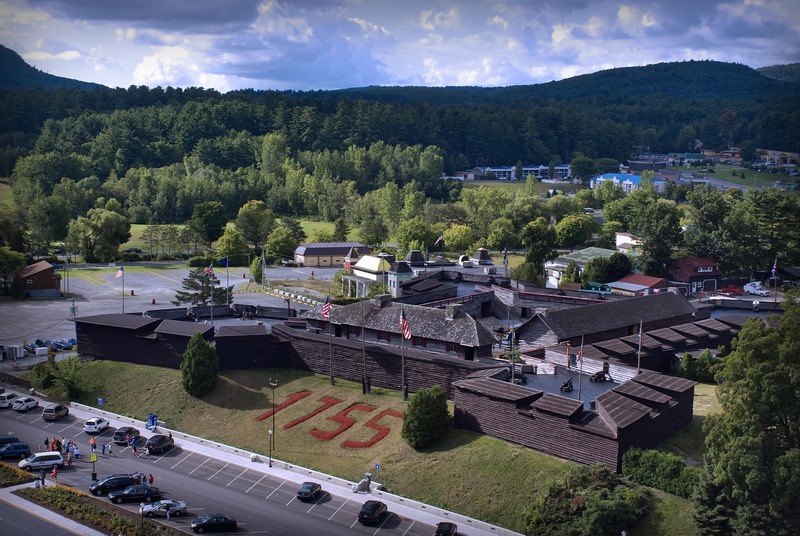 The fort is itself a replica, built on the site of the original Fort William Henry, a British outpost from the Seven Years’ War. It was besieged by the French and their Indian allies in 1757 and was compelled to surrender when reinforcements were not forthcoming. Some of the surrendering prisoners were killed by Indian warriors disgruntled by the French prohibition that kept them from looting the defeated fort. It was widely publicized as a massacre at the time and figures as high as 1,500 slaughtered were bandied about in the immediate aftermath. The real number, modern historians believe, is more like 200 killed and wounded, about 7.5% of the prisoners. The siege of Fort William Henry played a central role in James Fenimore Cooper’s The Last of the Mohicans. 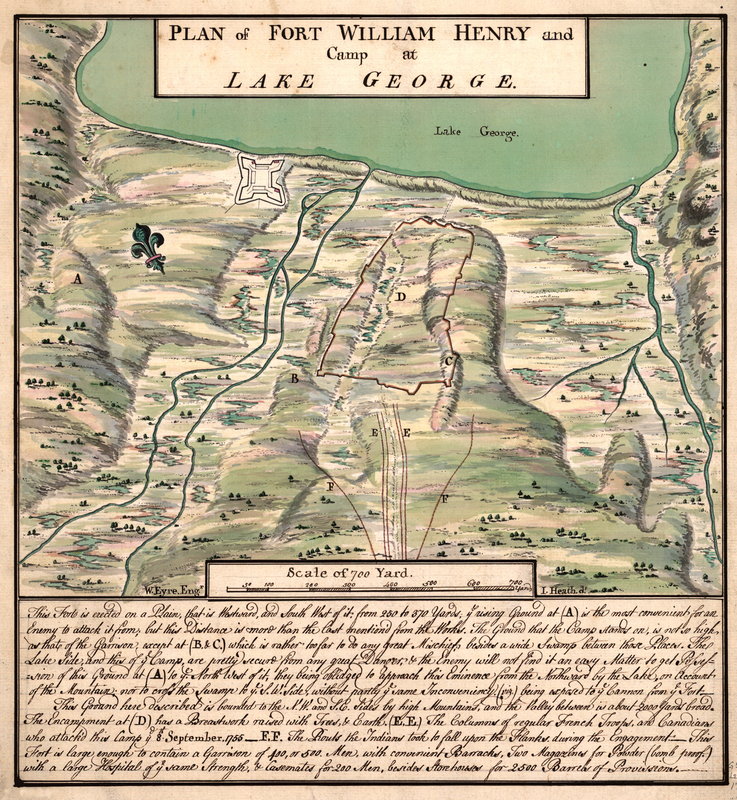 Because of the popularity of the book, the famous massacre, the short but bloody history of the fort and its ideal location on a lake in the Adirondacks, the site of Fort William Henry became a tourist mecca. To take advantage of the historical tourism market, the replica was constructed in 1954 as full-scale copy of the original. To lend it authenticity, the owners of the attraction wanted some genuine Colonial artillery. Among the 19 antiques were nine cannons which had been salvaged a few years earlier in the Florida Keys. Newspapers at the time of the sale noted the pieces were bought from treasure hunter Art McKee who had raised them from a wreck off the coast of Looe Key, a key named after the British warship HMS Looe which hit a reef in the area and sank in 1744. Named after the town of Looe, Cornwall, the ship only saw two years of service before its demise. The Looe was dispatched to protect the south Atlantic coast of America from Spanish incursions and interfere with Spanish shipping during a conflict that would later be blessed with one of the greatest names of all time: the War of Jenkins’ Ear. On February 5th, 1744, the Looe struck a reef and was grounded. The captured Spanish merchant ship following her suffered the same fate. The crews were evacuated, all food stores that could be salvaged were salvaged and then both ships were burned. In 1951, the Smithsonian Institution sent an expedition to Looe Key to explore a reported shipwreck from which a few coins had been retrieved. At the time, not even the precise date of the ship was known and certainly not the name. The fact that the key was named after a British warship that had gone down off its coast had been lost in the mists of time. Metal, glass and porcelain artifacts had survived the conflagration. The team recovered large numbers of artifacts — among them iron ballast, shot, bolts, nails, rum bottles, Chinese porcelain fragments, earthenware, pipes, animal bones from the pickled meat stores, the eyepiece of a navigation instrument and one 2,000-pound cannon barrel. They didn’t find a smoking gun, so to speak, that would immediately identify the ship, but they did find some clues. 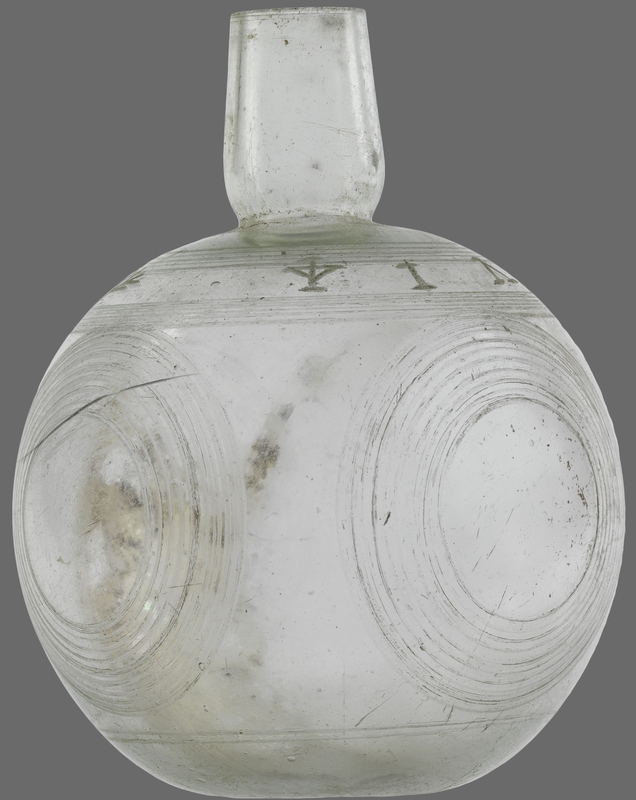 One of the 6-pound shots had an arrow on it, a mark indicating it was the property of the British royal family. The barrel was marked with a crowned rose, the insignia of Tudor and Stuart monarchs which was no longer used after Queen Anne’s death 1714. The lifespan of an iron cannon on a ship was no more than 40 years, which gave researchers an outside date for the ship of 1754. 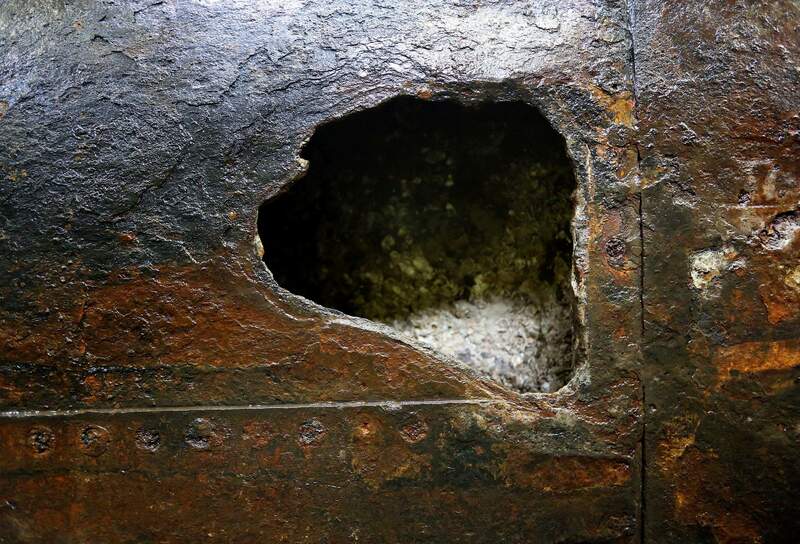 Inside the barrel the team found the remains of a wooden tompion which indicated the ship had not gone down in battle but rather by accident or misadventure. Armed with those few clues, Smithsonian curator of naval history and team leader Mendel L. Peterson hit the archives. Looking through the ship casualty lists for a British warship that sank between 1720 and 1750, was armed with both six and 12-pound cannons and was lost by accident, Peterson found an entry in Clowes The Royal Navy for “1743 Looe 44 guns, Capt. Ashby Utting, Lost in America.” He then confirmed that among those 44 guns were six and 12-pounders. Suddenly the name of the key made a new kind of sense, and it helped confirm that Peterson had identified the wreck. Looe Key is now part of Florida Keys National Marine Sanctuary so treasure hunters couldn’t make a meal of its underwater historic sites today, but back then it was unprotected. Art McKee followed in the Smithsonian’s footsteps. 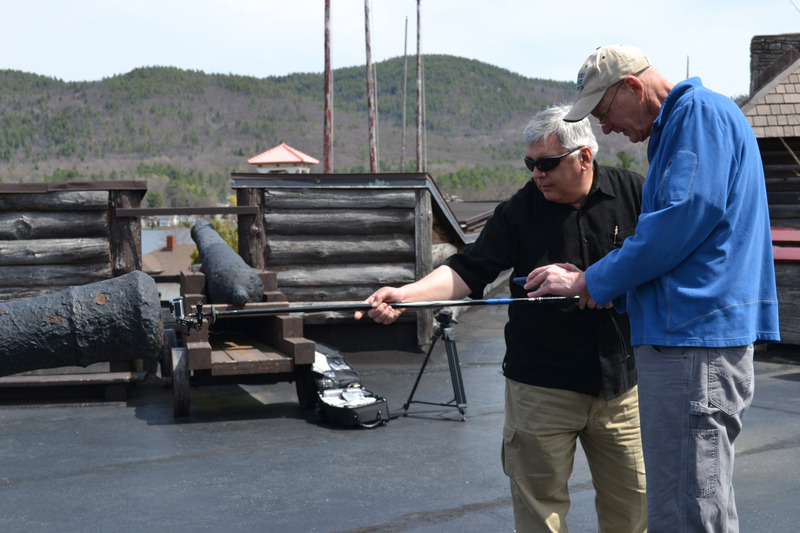 Once they were gone, he pulled up the heavy artillery they had left behind and sold it to the Fort William Henry Museum. At the time they were still marked with the crowned rose, a fact noted in articles about the acquisition. Exposure to more than 60 Adirondack winters has claimed the insignia, unfortunately, and in 1967 the fort’s records were destroyed in an arson fire so the cannons’ origins were lost. 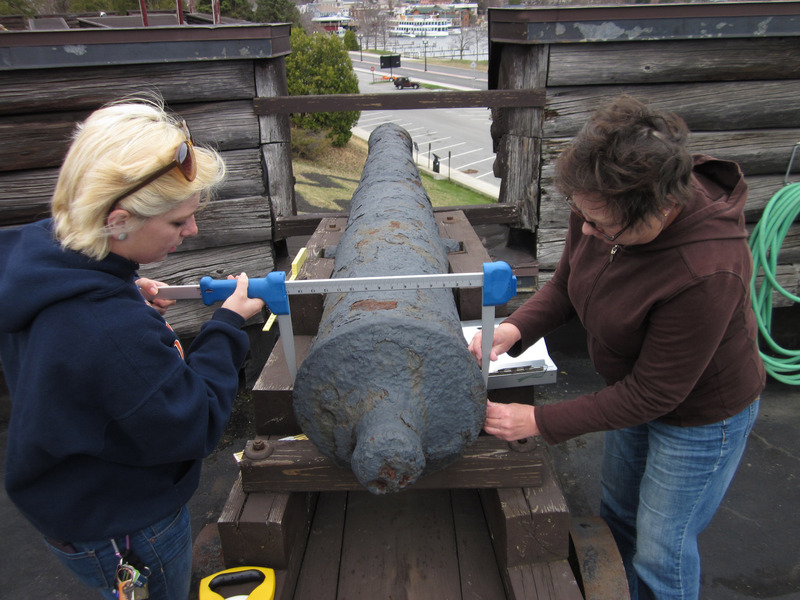 In 2014, researchers began to measure all of the fort’s artillery, replica and original. Discovering the source of the nine cannons bought in 1954 was part of the project, and now the research has paid off. The fort’s researchers discovered the caliber of the nine cannons matched that of the armament known to have been aboard HMS Looe when it sank. That fact, and McKee’s role in the guns’ salvage, leads researchers to believe the Looe was the source, [maritime archaeologist Joseph W.] Zarzynski said. “If Art McKee sold them, then they are most certainly from HMS Looe,” said Charles Lawson, an archaeologist for Biscayne National Park who has studied 18th-century wreck sites in Florida’s waters. The fort wants to restore those historic cannons which are heavily weathered and rusted now, but it’s going to take a major fundraising push. Restoring just one of them may cost as much as $30,000. Here’s a cool 20-minute documentary about the investigation into the origins of the nine cannons. Oracle bones are inscribed ox shoulder blades or the flat underside of turtle shells that were used for divination in Shang dynasty China (ca. 1600-1046 B.C.). The Shang was China’s second dynasty and the oracle bones are the oldest surviving texts in the Chinese language. They are the main source historians have about Shang China and Bronze Age China in general, but were only recognized as the immense cultural patrimony they are in 1899. Antiquarian Wang Yirong found some oracle bones being sold in Peking as “dragon bones” which were ground into powder and used in traditional medicine to staunch a bleeding wound. He recognized they were engraved with ancient script. 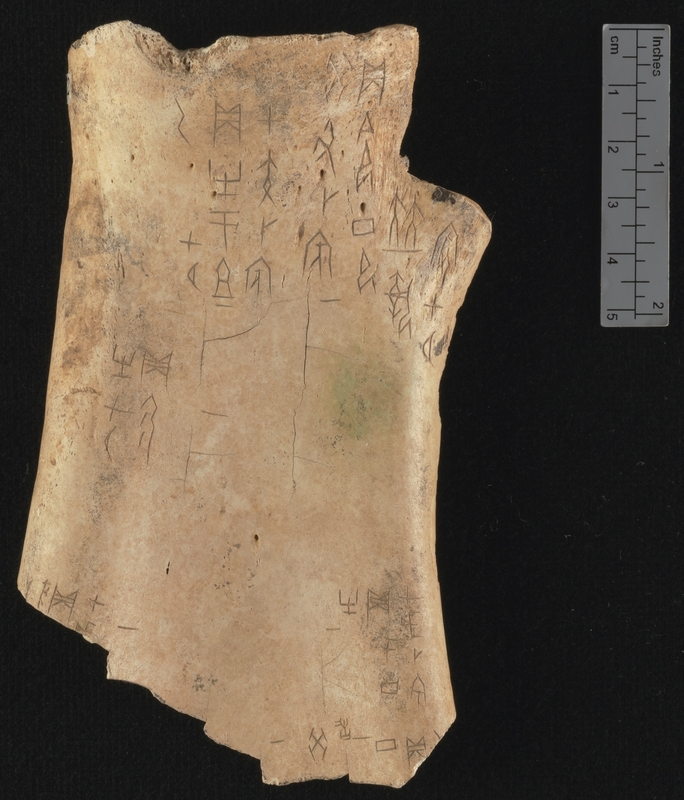 The oracle bones were dated to the Shang dynasty when the origin of the ones floating around in markets was discovered near the village of Xiaotun in Henan Province, the Shang capital. The late 19th, early 20th century was a turbulent time in China. Cultural patrimony issues were not governmental priorities and foreign scholars and collectors stepped into the void. One of them was Lionel Charles Hopkins, brother and biographer of the famous poet Gerard Manley Hopkins, a diplomat who went to China in 1874 and remained there until his retirement in 1908. He collected almost 900 oracle bones which he studied over the four decades of his retirement. He died in 1952 at the age of 98. Hopkins left his oracle bone collection to Cambridge University. Hopkins broke a lot of ground in the study of oracle bones, but he too was fooled by fakes. There were so many of them that for a couple of decades after their discovery, the authenticity of all of them were in question. It was only when excavations began in the late 1920s at Xiaotun that large numbers of oracle bones were confirmed to be part of the Shang royal archive. About 200,000 thousand bone fragments are known today, a quarter of which are inscribed. Diviners used the oracle bones to invoke the ancestors of the Shang dynasty royal family who were believed to know the future. They were also thought to have influence on future events. When a Shang royal wanted to know the outcome of a war, the success of a harvest, an impending natural disaster or anything else, they turned to diviners and their oracle bones. On the reverse of the bones diviners carved out divots known as divination pits. The pits were exposed to fire, creating vertical cracks with a short perpendicular crack halfway down on the obverse of the bone. The cracks were interpreted as answers to the diviners’ questions and those questions were engraved next to the crack. The divination served double duty: predicting the future and securing the benign intervention of the ancestors. The inscriptions are invaluable records of Shang society, and can be of international import. One of the oracle bones in the Hopkins Collection is the oldest dated record of a lunar eclipse known in the world. The texture of the bones and writing is important to historians, as are the divination pits and cracks. Within a couple of years of Wang Yirong’s discovery, rubbings of the inscriptions were published in books and suddenly collectors were clamouring to buy oracle bones. As usually happens when there’s an overwhelming demand for a finite material, unscrupulous dealers quickly produced as many forgeries as possible. Many oracle bones have both original engravings, pits and cracks, and forged text added to make a simple bone look fancier. The more text, the more expensive the artifact. Sorting out the genuine from the fraud requires careful examination of the bones, their inscriptions and cracks. 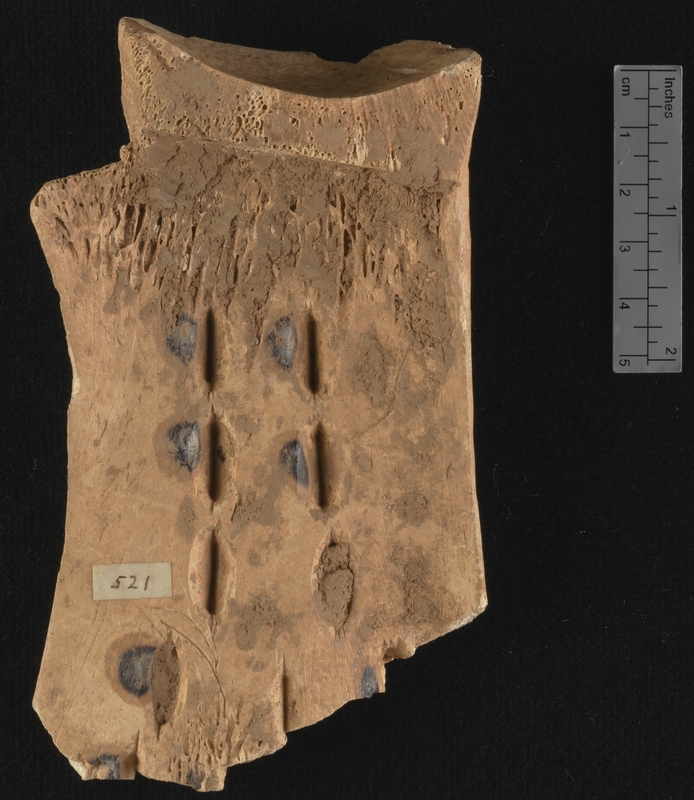 Since the earliest discoveries, the surface of oracle bones were captured with rubbings. In 1982, oracle bone expert Mme. Qi Wenxin visited the UK to make rubbings of all the bones in public and private collections. Cambridge’s Hopkins Collection was one of her stops. These rubbings are not the kind you made on gravestones in 5th grade art class with a crayon and tracing paper. Mme. Qi’s tools were a brush made of fine human hair, the finest quality Chinese black ink, very thin tissue-like paper, a piece of silk wrapped around natural cotton and a water infused with the herb baiji (Bletilla Rhizome). Baiji is used in traditional Chinese medicine to stop bleeding and reduce swelling, but infused in the rubbing water, it helps the paper adhere to the bone. If plain water was used, the paper would come off during rubbing. The side of the bone not being rubbed was fixed to the table with putty. Then the paper was placed on top and brushed with the baiji solution. Mme. Qi tapped the wet paper into the engraving by lightly hitting it with the human hair brush until every letter of the inscription showed through the paper. When the paper was dry, the silk-wrapped cotton was dabbed into the sticky ink and stippled on with care not to cake it on too thickly. Once the ink layer dried, another was applied. The process was repeated until the inscription becomes clear, a white negative against the inky black background. You can see Mme. Qi at work in this video. Now the Cambridge University Library has taken the first step in establishing a new kind of archive. 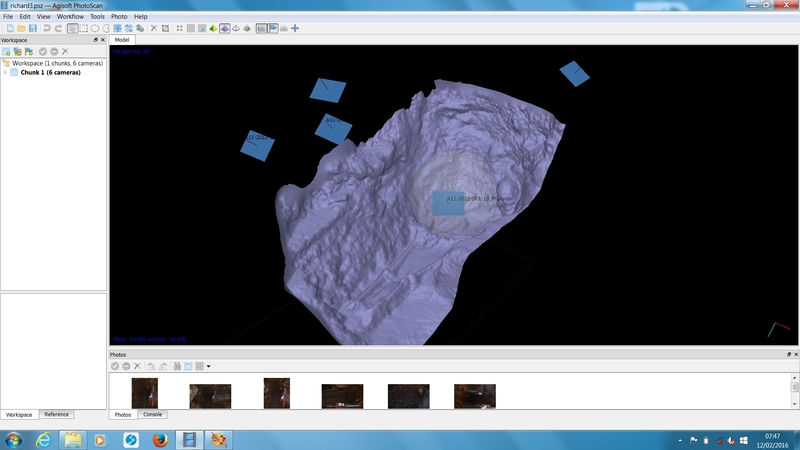 It has scanned the first of the 614 oracle bones in its collection in high resolution 3D. As far as we know, it’s the first oracle bone in the world to be 3D scanned. The image brings into sharp focus not only the finely incised questions on the obverse of the bone, but also the divination pits engraved on the reverse and the scorch marks caused by the application of heat to create the cracks (which were interpreted as the answers from the spirit world). These can be seen more clearly than by looking at the actual object itself, and without the risk of damage by handling the original bone. Once scanned, a precise replica of the bone was 3D printed so it can handled and examined by students and researchers who would otherwise not be allowed access to the originals for conservation purposes. If the 3D scanning trend catches on, there’s another exciting possibility: that more of the hundreds of thousands of fragments may be pieced back together thanks to computer matching. 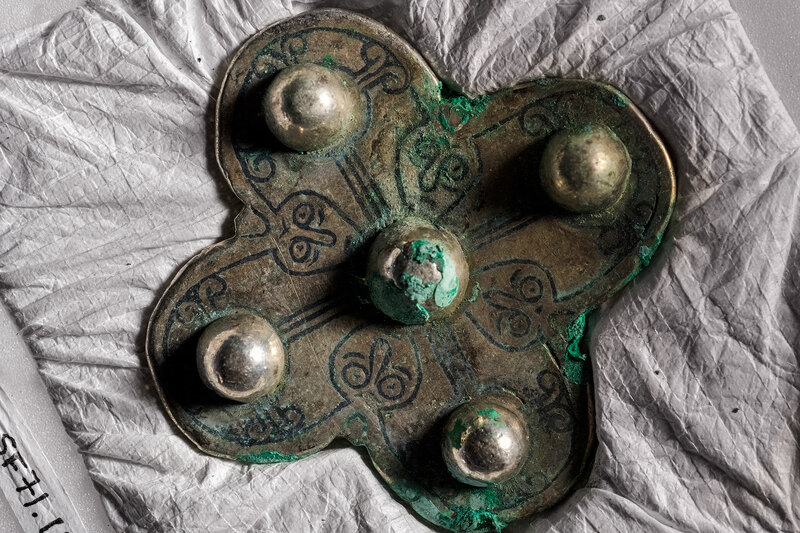 Historic Environment Scotland has released the first images of the objects found inside the Carolingian pot that was part of a Viking hoard discovered in Dumfries and Galloway, Scotland, in September of 2014. Archaeologists took the unusual step of CT scanning the rare silver alloy vessel shortly after it was unearthed because they were concerned it was too fragile to just take the lid off and see what it contained. 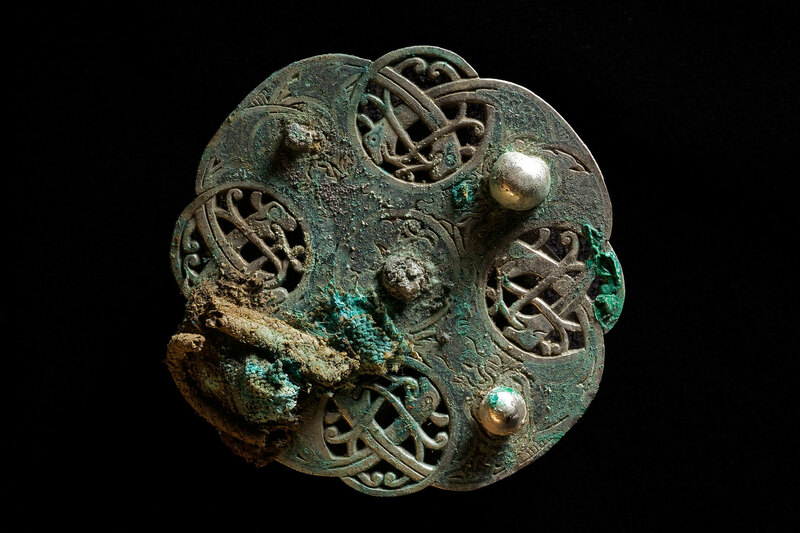 The scan identified at least one Anglo-Saxon openwork brooch, four other silver brooches, some gold ingots and ivory beads coated in gold, each wrapped in an organic material. 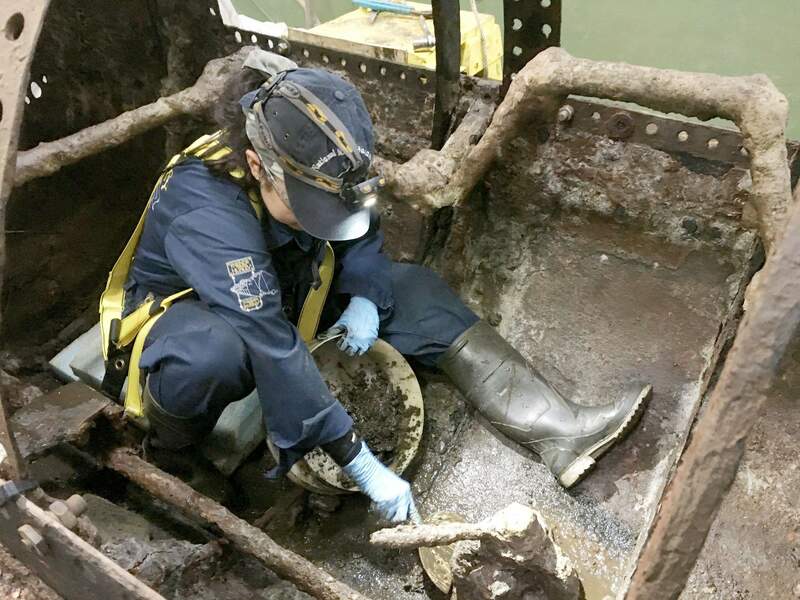 Armed with a CT roadmap of the vessel’s contents, conservators painstakingly excavated the interior, taking care to preserve every fragment of organic material they could to prevent it from crumbling into dust when exposed to the air. In addition to the ingot and silver-encased ivory beads detected on the scan, they found a total of six Anglo-Saxon silver brooches, one penannular brooch likely made in Ireland, a richly decorated gold pendant which may have held holy relics, several mysterious gold and crystal objects and, breaking the precious metals trend, two large seeds of nuts. The nuts have yet to be identified, but obviously they came from a very special plant that probably wasn’t indigenous to the area. 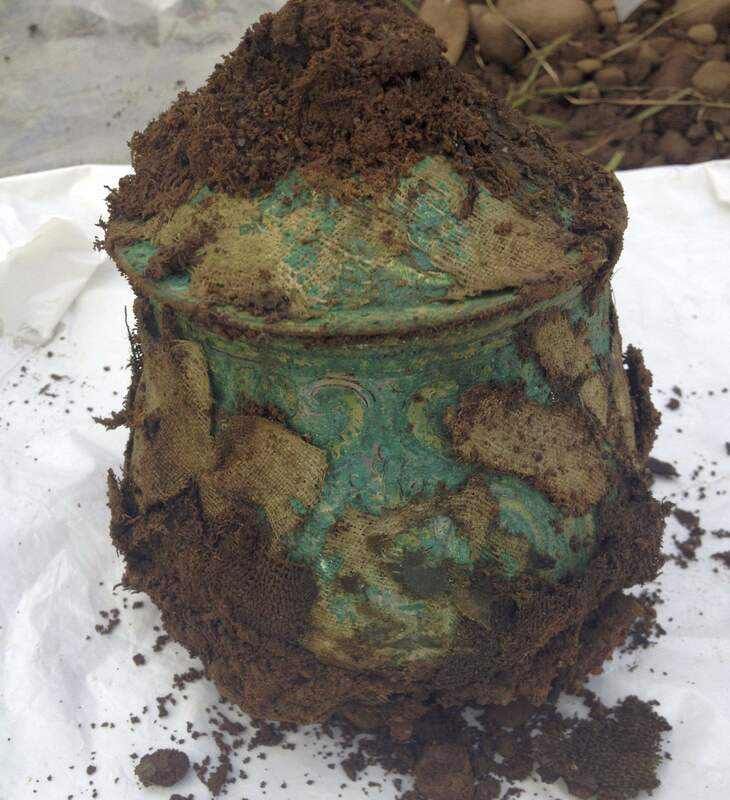 The hoard was found in two layers: a top one 24 inches under the surface with silver armbands, ingots, a gold bird pin and a silver and enamel cross wrapped in a silver chain, and underneath it the pot. It’s the largest Carolingian pot ever discovered and there are only six known. 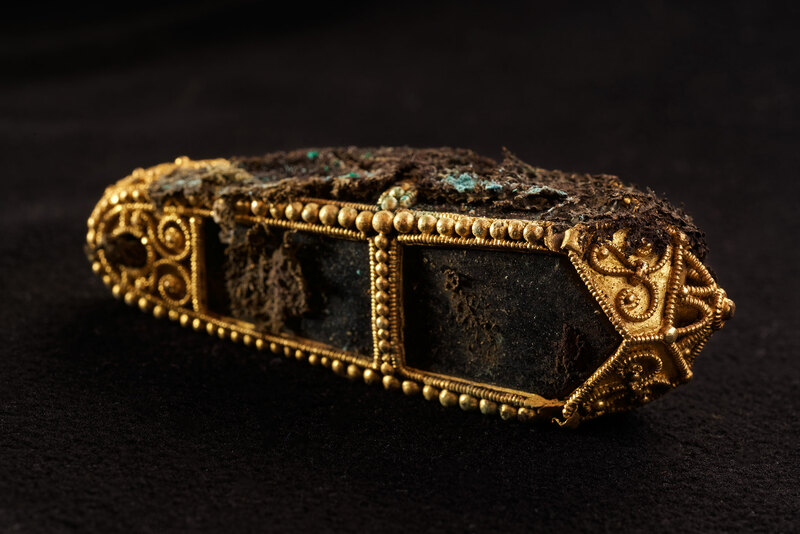 Scholars believe it may have had been used for important Christian ceremonies and was raided during a Viking incursion on a monastery or church in Germany or France. By the time it was buried, it could well have been a family heirloom. The levels appear to have been arranged according to the their importance. The pieces on top were valuable, but most of them were the kind of thing that was cut up for currency, ie, hacksilver before the hacking. The pot, on the other hand, and its contents, must have been deemed of greater significance to their owner. Each object was wrapped in a textile and placed inside the vessel which was topped with its lid and then it too was wrapped with cloth or leather. Textile experts studied the fragments from inside the pot and identified several of them as silk samite, a super deluxe fabric woven in Byzantium, North Africa, or southern Spain. This fabric was exclusively the province of monarchs, the highest ecclesiastical officials and the remains of venerated saints buried in churches. 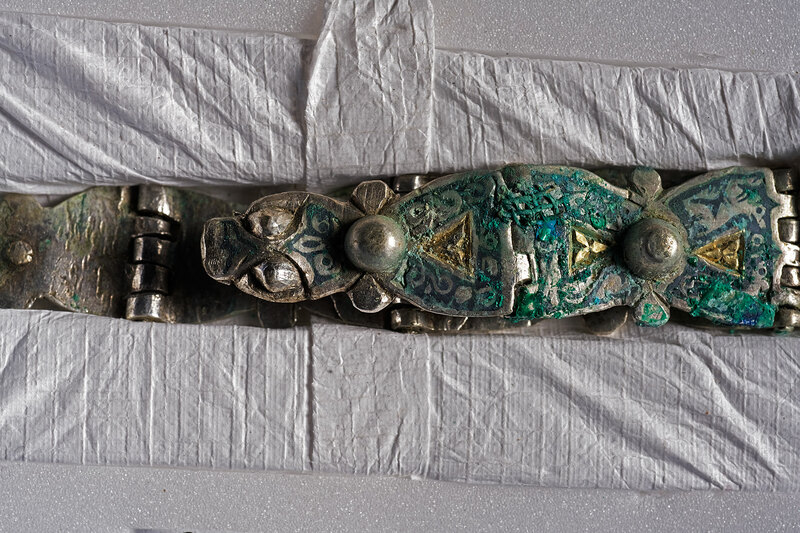 The style of the artifacts in the hoard date them to the 9th and 10th centuries, which means the hoard was likely buried in the 10th century, a period when the Vikings in the British Isles had suffered setbacks after more than a century of successful raids starting in the 790s. In the 9th century there was extensive Norse settlement of Scotland and the their military victories continued even as the country unified under Kenneth MacAlpin, King of the Picts and first King of Scotland (Alba). Several of his successors — Constantine I, Indulf — died fighting the Norse. Then there were the English to deal with. In 937 King of Scotland Constantine II allied with his once and future enemy Olaf Guthfrithson, the Viking king of Dublin, to defeat the invading army of Æthelstan, King of England. They lost. It was a one-battle alliance anyway, and the conflict between the Scots and Norse continued throughout the century. Galloway itself had a strong Viking presence from the 9th until the 11th century. It’s in southwest Scotland, with Norse-heavy Cumbria just to the south and the Norse-dominated Irish Sea to the west. The people who lived there in the 10th century were mostly Vikings in language and culture. The person who buried the hoard was likely trying to protect his savings rather than burying it as a religious offering. That’s why he was so very careful about how the valuables were buried. He planned to recover them but never did. The ultimate fate of the hoard has yet to be determined. 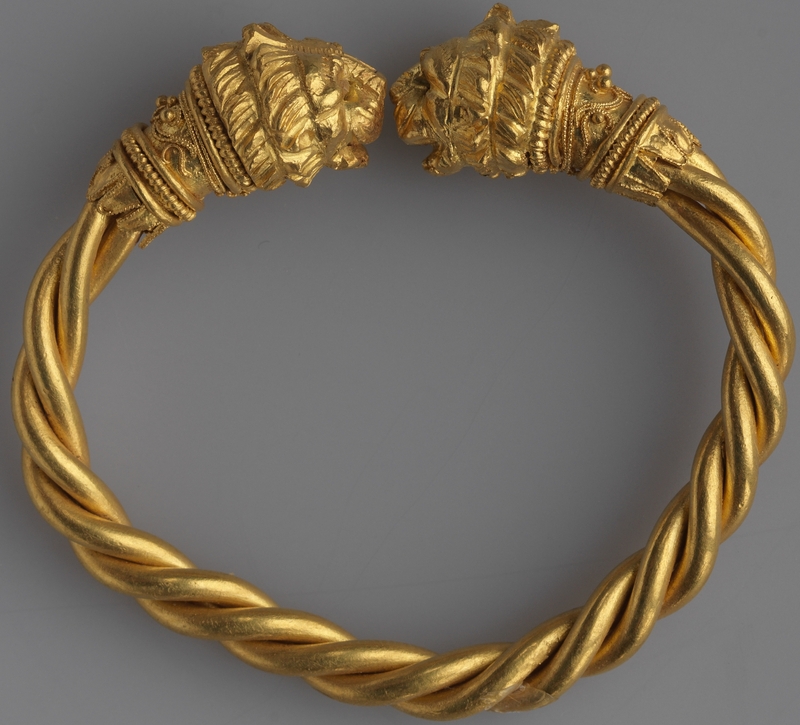 Its market value will be assessed by Scotland’s Treasure Trove Unit and the hoard will be offered to Scottish museums. Whichever museum wants it will have to raise the value of the hoard as a reward which will be split between the metal detectorist who discovered it, Derek McLennan, and the landowner, the Church of Scotland. The value is sure to be very high. 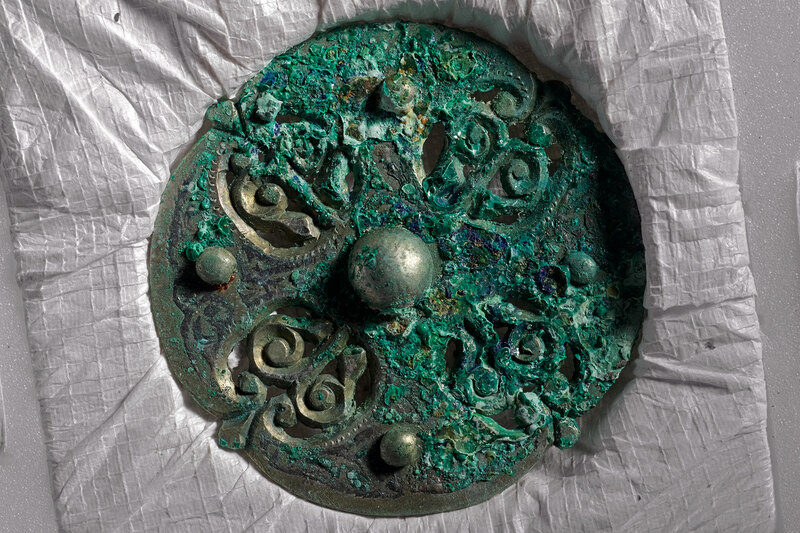 No other Viking hoard has been found with such a wide variety of objects — gold, silver, glass, enamel, textiles — from such a wide geographic area. Preliminary estimates put it at between £500,000 and £1 million, closer to the latter than the former. It’s been a year since the mortal remains of King Richard III were reinterred in Leicester Cathedral. Archaeologists from the University of Leicester are ushering in the anniversary with a 3D reconstruction of Richard III’s grave as it was when it was first fully excavated in September of 2012. 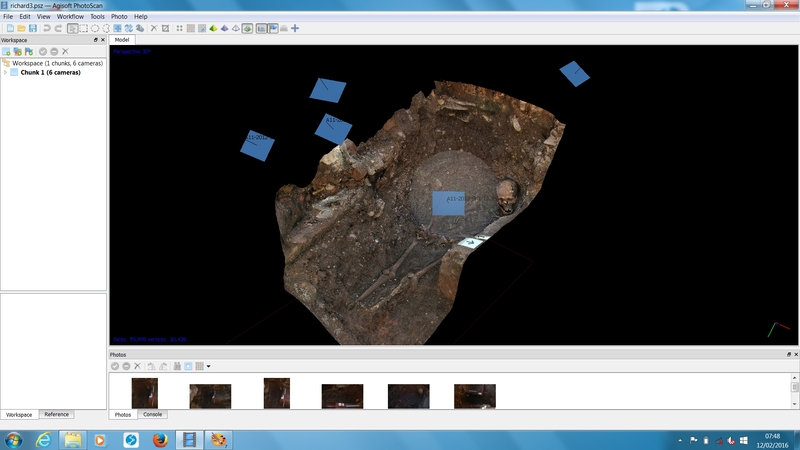 Photographs from the excavation were run through Agisoft PhotoScan software which processes images photogrammetrically to generate a 3D digital model. The software looks for shared elements in overlapping photographs which are then plotted onto a 3D point cloud. The cloud is converted into a polygon mesh and the photos applied to it so the topographic layout has a photorealistic surface. 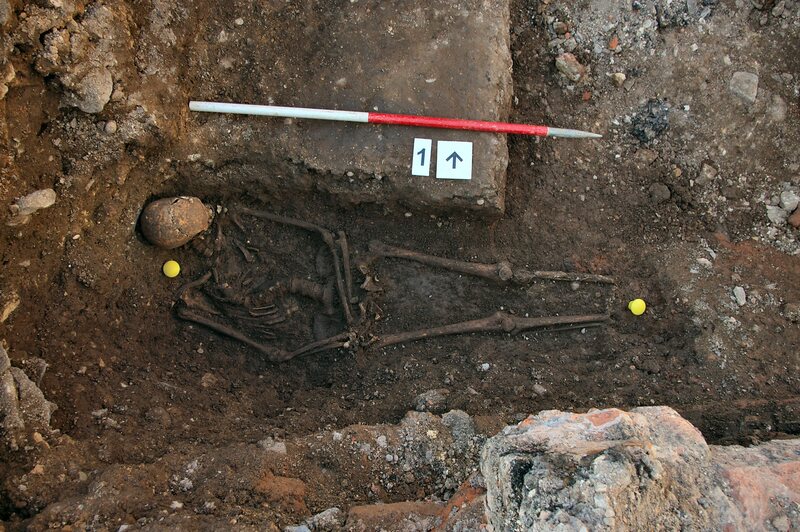 Mathew Morris, Site Supervisor for University of Leicester Archaeological Services was the man who first discovered the remains of King Richard III on the first day of the dig under the Leicester car park. He said: “Photographs and drawings of the grave, whilst dramatic, are only two-dimensional and do not always best show nuances in spatial relationships that a three-dimensional model can. It also artfully conveys how shoddy a grave it was. It’s too short for one, which is particularly half-assed when you consider that Richard’s spinal curvature made him shorter than average. (Without the scoliosis, he would have been 5’8″ tall, about average height for the time. The S-curve in his spine knocked a couple of inches off his height.) The sides of the grave were not dug straight, but with sloping sides. The bottom of the grave was uneven. You can see on the 3D model just how restricted the space was, how the body leans towards one side like when you’re way too old to have to sleep in a twin bed and the head is propped up uncomfortably. The interactive model has been uploaded to the 3D sharing platform Sketchfab. There are five points of note marked out — his skull with its war wounds, his curved spine, his missing feet, lost when a pit intersecting with the unknown grave was dug centuries later, the titled head indicating the grave was too short for the body and the sloped sides emphasizing how carelessly the grave was dug. There’s very little content, but when you click on one of the numbers, the view shifts in a neat way. It’s fascinating to see the grave from every possible angle, as if you were lying underneath it, above it, inside it or next to it.